Well to end my first week's stringing I spent Saturday in Tralee Tennis Club. This has to be one of the most active clubs in Munster at the moment. They have recently added anupstairs to their clubhouse which provides a viewing balcony over the four courts. It has being a great addition and makes watching matches very easy and enjoyable. I have visited Tralee before in my previous job and have always being well received and this time was no different. I would like to thank their Chairperson, Roberta who was nothing but helpful from day one. All members were notified twice of the visit and posters were put up in the clubhouse. I would also like to thank Nuala, who as always, was available on the day to offer any assistance needed. The idea behind the onsite stringing came about from a previous visit to Tralee. Unfortunately, as in a lot of clubs, there are not too many places locally to get your racket restrung. And more importantly to get the right advice. On one such visit there was a lot of requests for stringing, which led to a very busy day for yours truly. In my time in Maher Sports I, and the other stringers, have had to correct many home stringing jobs. What I have found from speaking to customers over the years, and on a fair few occasions this week, is that they weren't asked for an input when getting their racket restrung. It seems like the stringer knows your game better than you, and therefore they don't need your input at all. That is a huge mistake. The player has to be tell you as much as they can about their game, how hard they hit the ball, how long is their backswing, do they play serve and volley or all baseline. All these factors have to be taken into account and even then it may take a couple of stringing jobs to get it right for them, the point being you are there to get it right for them, not to tell them what is right for them. 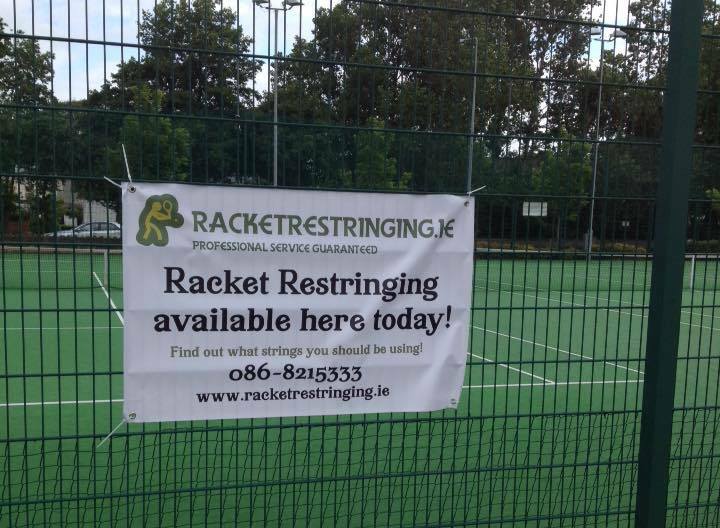 The onsite stringing service is available to any club wishing to avail of it. What I offer is to spend a day, or an evening if that suits better, in your club with my machine and a large choice of strings. From here I will meet any member wishing to avail of the service and discuss with them, their game, the types of strings available and from here settle on what we think, between us, will be the right choice for them. The rackets will be strung on the same day. This saves members travel time dropping off and collecting their rackets. For the event to run to the best of its ability, the club would need to advertise and promote the event well. Club coaches should be onboard as they are the people who know their players games better than most. If it is promoted properly in advance, as was done by Tralee, I would expect to receive calls from members prior to the event to discuss their needs. This gives them time and knowledge to do a bit more research prior to coming to see me and from here we will be closer to finding the string that suits them best. I had a good few calls from members of Tralee tennis club in advance and they all commented on how they found this helpful. If you think your club would be interested in one of these days, I will be back in Ireland for July and August, feel free to contact me. Many thanks again to the committee and members of Tralee for an enjoyable day.